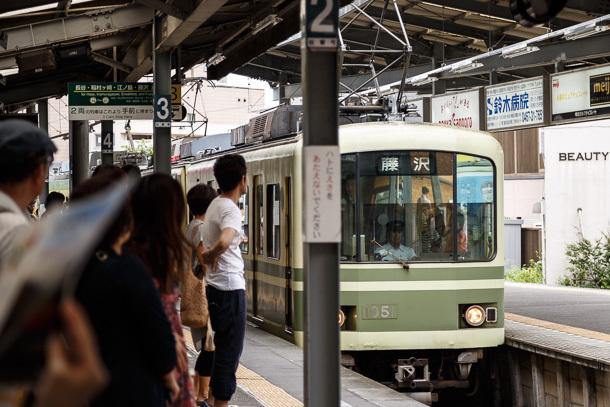 I only have the chance to ride public transit in Japan every so often, but I am still able to observe it almost everyday through its frequent inclusion in anime and other pop culture media. 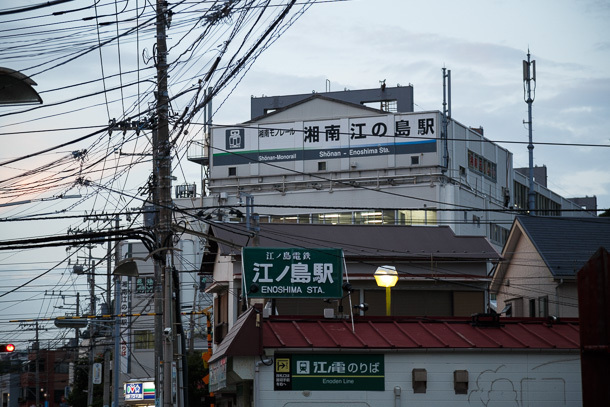 The Enoshima Electric Railway (江ノ島電鉄), or Enoden (江ノ電), is something of a poster child for this phenomenon, notable not just for how often it appears but also its proactive approach to marketing itself through this channel. 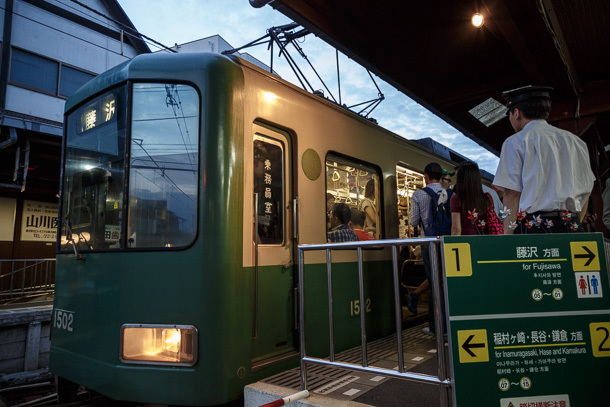 The charming little green and yellow train, which shuttles riders between Kamakura and Enoshima/Fujisawa, is embedded in the popular imagination through mentions or appearances in novels, films, music, games, TV dramas, manga and animation. 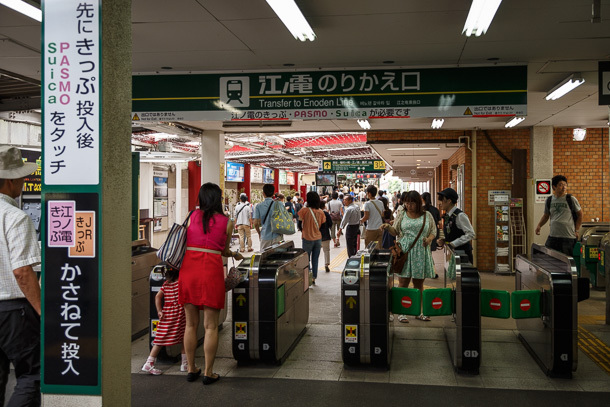 While the use of the trains, stations and crossings probably originates almost always as a creative choice, the railway, now part of the Odakyu Group, is quick to seize on potential collaboration and cross-promotion opportunities. With regard to anime specifically, how this usually plays out is that a light novel or manga that includes the railway will be green lit for broadcast anime adaptation, and for a select few of those Enoden will be involved in consultation on the creative side, providing input or access that informs how the line is depicted. 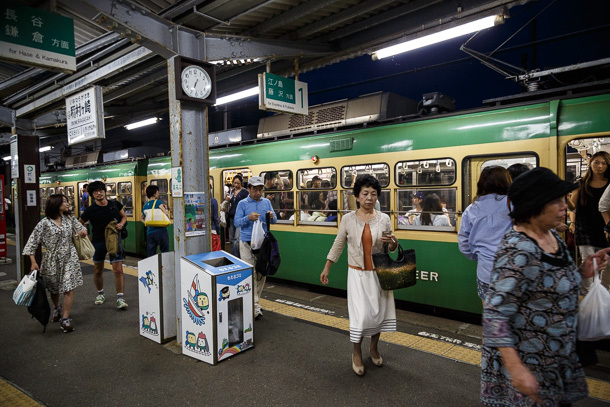 The railway then uses advertising space in the trains and stations, and other means to promote the shows as they air. 2014 Summer’s Hanayamata is Enoden’s current engagement. In the show, the trains and some of the stations and crossings appear in the opening credits and several of the episodes. 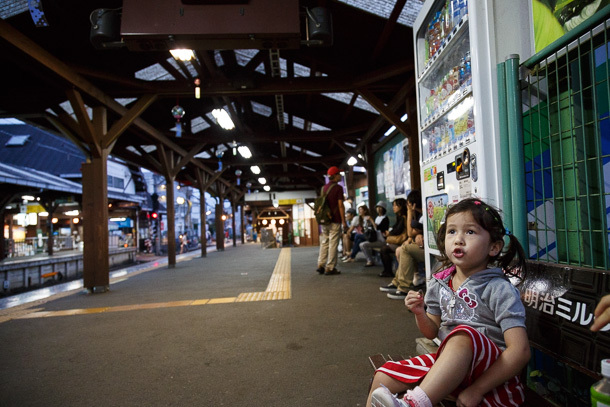 Though I’m not sure of Enoden involvement, 2012’s Tari Tari is the most recent to have extensively featured the railway. 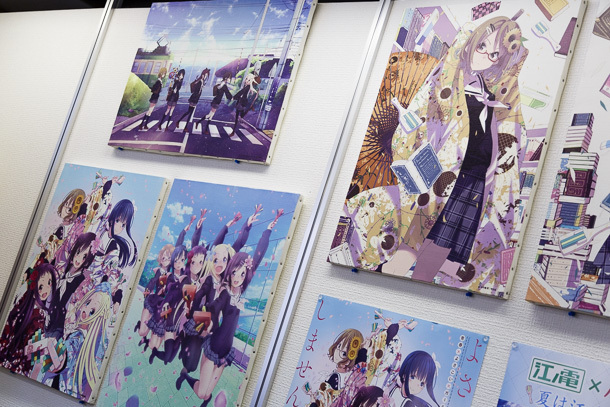 Beyond Tari Tari, since I began my weekly review of transit in anime, the train or its stations have also appeared in Isshūkan Friends., Gokukoku no Brynhildr, Tsuritama and Natsuyuki Rendevouz. Earlier shows off the top of my head include Slam Dunk, Aoi Hana, Elfen Lied and one of my favorites, Mahōtsukai ni Taisetsu na Koto: Natsu no Sora. 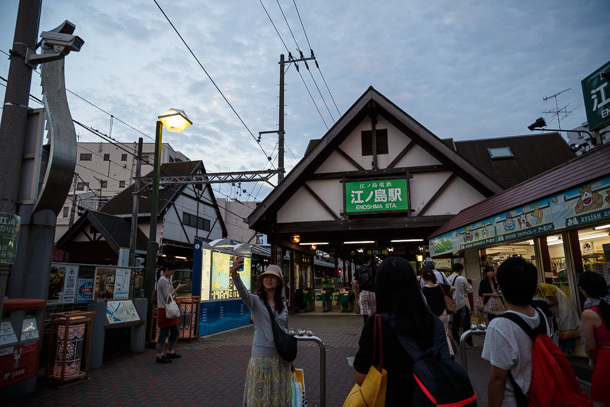 When we visited on 2014 August 31, we were making a beeline for Enoshima, so forewent the commemorative Hanayamata tickets and stamp rally that has been popular with fans this summer. 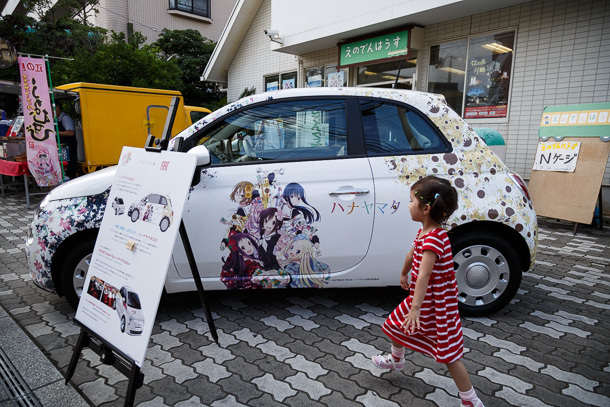 From Twitter, I’ve seen that quite a few of the cars feature Hanayamata advertisements, though we somehow managed to miss them for all legs of our trip. 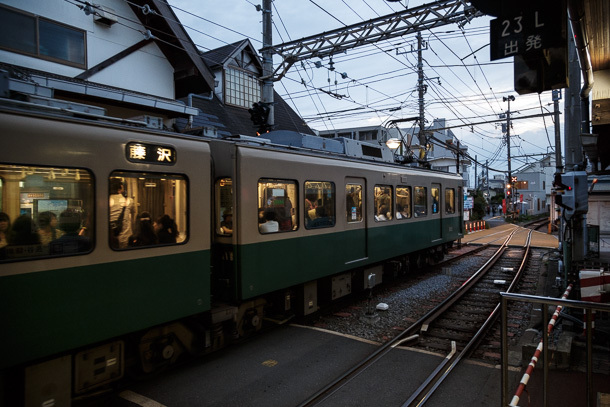 Enoden uses a mishmash of older and newer rolling stock, this Type 1000 being somewhere in the middle. 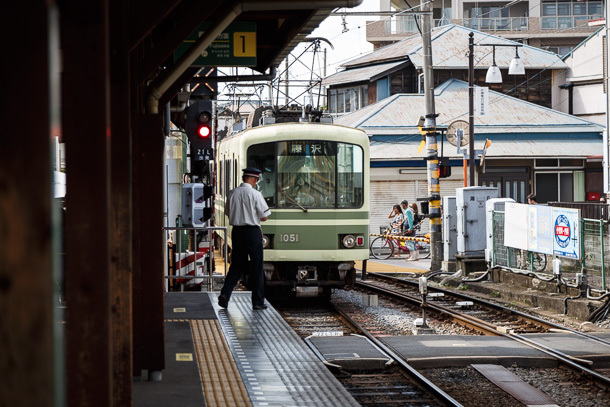 Views of the Sagami Bay and Enoshima are one of the best features of the line, though if you’re serious about getting good images you’ll want to wait for a clear day and get off at one of the stations so you aren’t shooting through the windows. The line alternates between the coast and threading through neighborhoods and tunnels at the foot of the mountains. 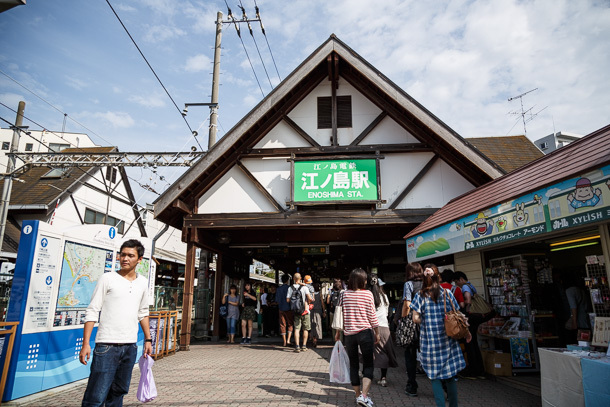 Enoden House is the railway’s souvenir shop near Enoshima Station, and doubles as a small exhibition space. It often hosts special events and features materials from shows with which the railway is collaborating. 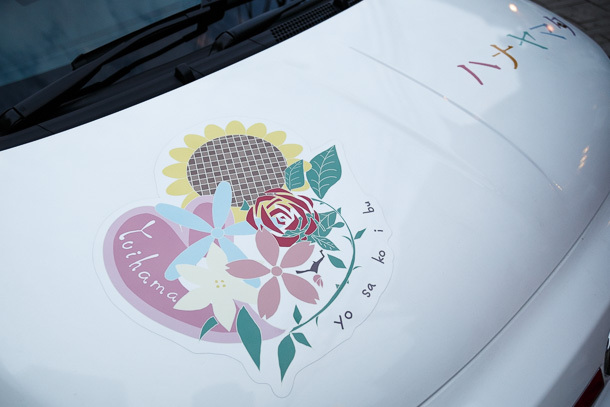 The Hanayamata exhibit included this Fiat itasha parked out front. 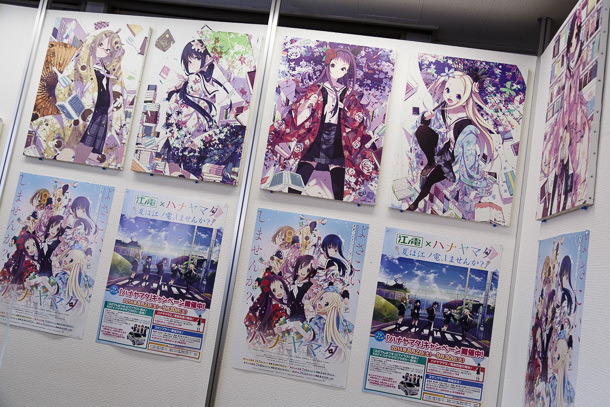 In addition to the artwork, inside were plenty of Enoden souvenirs and toys for children that are available year round. 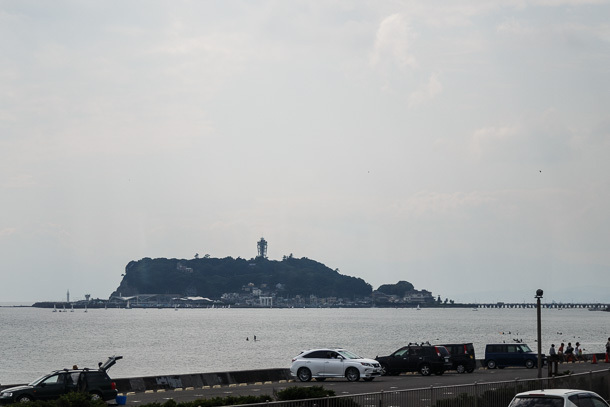 Enoshima Station is adjacent to Shōnan-Enoshima Station, the southern terminus of the Shōnan Monorail. 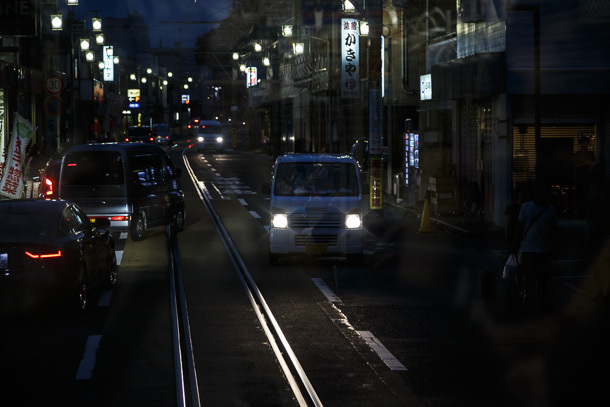 Although it was the peak of the summer tourism season, Kamakura still goes to sleep fairly early in the evening. After 7:00, the headlights and clacking wheels of the Enoden, along with the red lamps and chimes at fumikiri, are often the only things punctuating the quiet and moonlit neighborhoods, an atmosphere captured wonderfully in the first episode of Hanayamata. 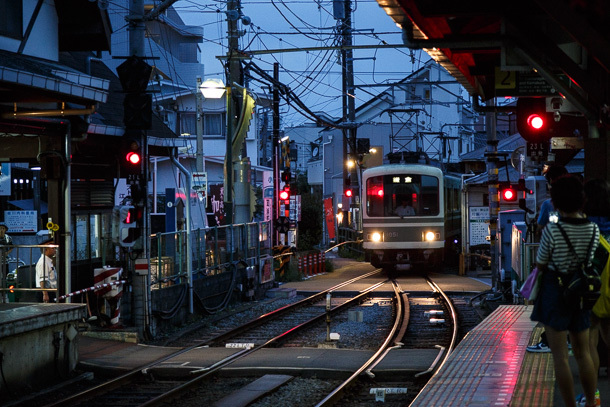 This 450 meter section between Enoshima and Koshigoe station is the only segment where Enoden runs on tracks in the street. 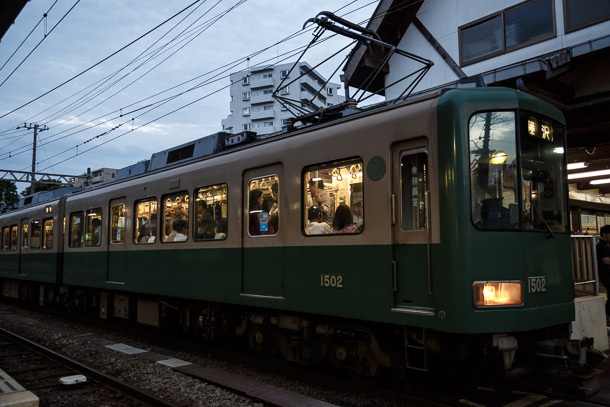 The Type 300 isn’t the oldest of the currently operating train types, but is often invoked as the classic image of the Enoden. It’s also part of the collection of images used to convey the breezy, homey, comfortable feel of the seaside town. I often joke with my daughter that I’m doing “cartoon work” when I’m taking notes during anime and putting together my weekly posts. 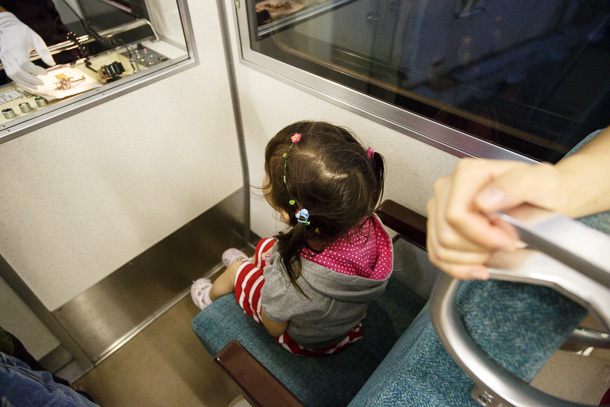 While she isn’t old enough to understand things like how media portrayal influences perception of public transit, she definitely figured out that the green train Hana and Naru ride actually existed, and it was by her request that we make the day trip to Kamakura so that we could ride it. In Beijing, where we live, we are constantly bombarded by an emphasis on private car ownership as a status symbol. My hope as a transit advocate and parent is that I can encourage her to cultivate a fondness for public transit in spite of that. It’s easier to do that when transit operators take extra steps to reinforce the message that they are not just practical, but enjoyable and (occasionally) hip too. Enoden shows us one way it can be done. 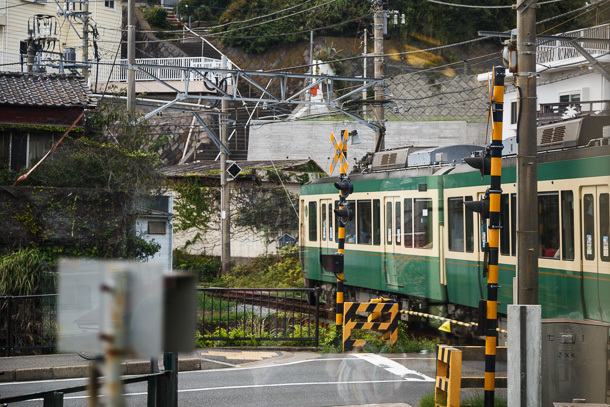 Enoshima Electric Railway is currently (end of 2018) getting a big promotion with the unexpectedly successful “Bunny Girl Senpai” anime on TV. 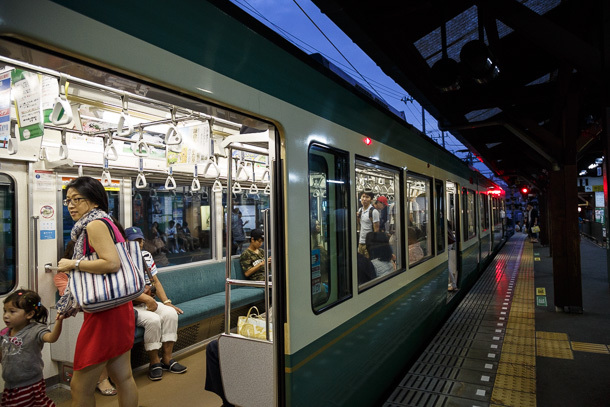 Already during the OP song (Kimi no sei by The Peggies) the green-beige municipal train receives a lot of on-screen presence and there will be a full-lenght Bunny Girl movie. Hi Tamas- Thanks for your note. I’m enjoying “Bunny Girl” too, though from where I’m sitting it wasn’t too unexpected. Many butaitanbou-sha were talking about it and preparing for scene hunting since the time the series was announced. Because the railway pursues these tie-ins as part of its formal business strategy, sometimes I feel there is an overabundance, with the trains appearing in one or more series almost every season. But the pilgrimage community in Japan is fairly prescient in picking out the ones that will have real substance.